Going under the sea on a Sea Trek helmet dive in St. Maarten. The rest of us listened intently to the rest of the briefing. The man pointed out that the helmet weighed about 75 pounds. However, in the water, it would only feel like 15 pounds. It would rest on your shoulders, unattached to anything you were wearing, open at the bottom. The air would keep the water from coming in. The air comes to the helmet via a hose from a manifold floating on the surface. It would also be feeding seven other helmets. The manifold gets the air from two compressors that alternate to provide a continuous supply of air without interruption. There is also a back-up system of air cylinders. The system would provide each participant with three times the air used in normal breathing. 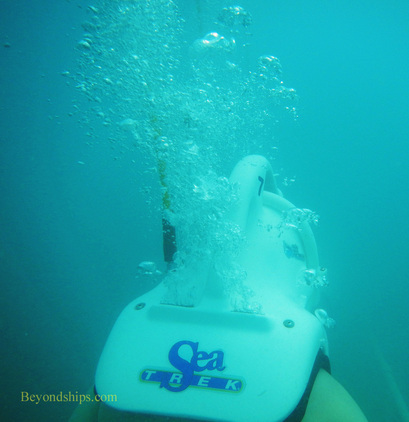 Unlike scuba divers who can jump into the water, we would be entering the water via a ladder descending from the barge to the trail on the bottom of the sea some 20 feet below. As we climbed down the ladder, the helmet would be placed on our shoulders. Sea Trek scuba divers would then assist us down to the bottom. It was very important that we pop our ears as we went down the ladder in order to equalize the pressure. This could be done by yawning, swallowing or reaching under the helmet. Indeed, as I found out, the pressure does change even in such a seemingly shallow depth and until your ears pop, it can hurt. He also pointed out that underwater, all communication would be by hand signals. Thus, if someone felt uncomfortable or did not want to do something, he or she would have to use hand signals to communicate to the Sea Trek divers who would be accompanying us. We then learned a series of hand signals. The talk lasted about 10 minutes and covered other topics as well. It was comforting that the people in charge were taking all of this quite seriously. While it certainly provided food for thought, everyone appeared eager to proceed. Inasmuch as the floating manifold can only handle eight hoses at a time, our group was divided in two. 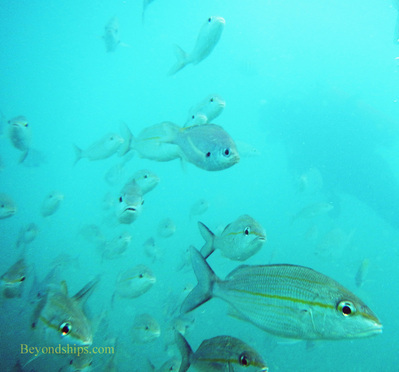 While the first group was underwater, the other group could snorkel in the area surrounding the dive site. However, everyone in my group elected to sit in the hut and prepare themselves for the underwater trek. After about 20 minutes, the first group returned. As they climbed out of the water, each seemed exhilarated by the experience. One by one, our group went down the ladder. The water was surprisingly cold and took some getting used to. When the helmet was placed on my shoulders, I could feel its weigh but as I became immersed in the water the weigh seemed to disappear. The environment inside the helmet was not what I expected. In some ways, it was like being in a very small room, with my head closely confined. At the same time, the rest of my body was free with no constraint. Instinctively, I felt like taking the helmet off but the logical part of my mind told me that this would not be a good idea. It also felt odd to be underwater and not be swimming. But, the helmet only works if you stay upright, so walking is the only way of getting around and the ladder is the only way of ascending or descending. I missed the freedom of swimming. Another thing that took getting used to was that you could not simply turn your head if you wanted to see something to either side. As above, the helmet rests upon your shoulders. The front of the helmet is an expanse of clear material. However, the sides and back of the helmet are opaque. Therefore, if you want to see something to either side, you have to turn the upper part of your body. Quickly, I became used to this new world. On the other side of the helmet, numerous pairs of eyes were staring in. They were all sorts of colors, shapes and sizes. They were totally unafraid. When they realized that I had not brought them anything, most swam away but some seemed to stay nearby throughout the tour. Above: A Sea Trek diver points out an interesting creature. It was a gauzy, light blue world. The metal handrails that marked the trail disappeared into the haze. I could not see objects until I was fairly close to them but this added to the feeling of adventure as I never knew what was coming next. Sea Trek had placed a number of objects along the trail. There was the wreck of a civilian submarine which at one time had been used to give undersea tours. Another sight was said to be an old helicopter but I could not really make it out. There were also more whimsical objects such as the “Pirate Jail.” This was a grid of metal bars and you could have your photo taken peering out from behind it. One of the Sea Trek divers took photos throughout the tour, which were available for sale at the dive hut. 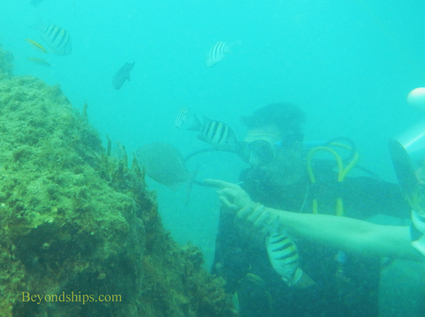 At one point, one of the divers was pointing to some creature on the other side of a coral outcropping. This must be where we battle the giant octopus, I thought. 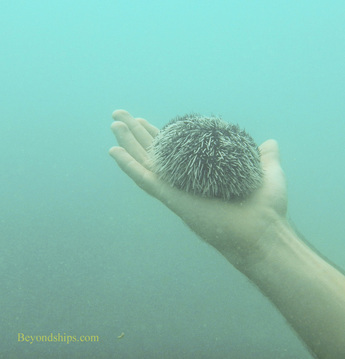 However, it turned out to be a sea urchin. We were also given the opportunity to hold another similar creature. No battles. At the end of the tour, however, there was a frenzy. A diver placed a small amount of food in each guest's hand. 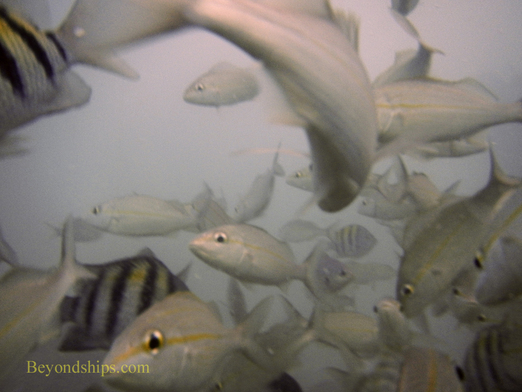 Suddenly, the water was full of fish, diving and nibbling. The food was gone in less than a second. Upon reaching the surface, the participants emerged tired but happy. It had been an exciting experience visiting this strange world. Somewhat different than John Wayne's adventure, but I didn't really want to battle a giant octopus anyway.